The company was initially founded in 1966 under the name 'Sound of Music' (a store specializing in audio products) and in 1983 the company renamed themselves Best Buy Co., Inc. and started to also offer consumer electronics and home appliances. In 1989 Best Buy Co. became Best Buy. The company is best known for their large number of retail stores throughout the US and Canada. 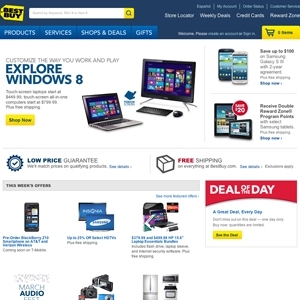 Their website BestBuy.com attracts millions of online shoppers each year. The Best Buy 'deal of the day' page offers a highly discounted product every 24 hours. Best Buy also offers new, pre-owned and refurbished consumer electronics at highly discounted prices on their other website Cowboom. Bestbuy.com currently ranks #4 amongst sites offering online deals -- Walmart ranks #3. In the General Merchandise category, Best Buy ranks, once again at #4 -- Walmart.com again ranks slightly higher and the same as before, at #3. Offers specials on computers, electronics, audio, video, software and more.